Find out about who gets lung cancer, where it starts and how common it is. 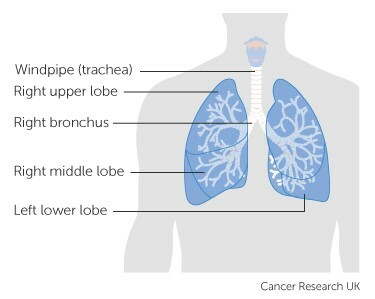 Lung cancer is cancer that starts in the windpipe (trachea), the main airway (bronchus) or the lung tissue. Lung cancer can start in the windpipe, the main airway or the lungs. It develops when there is uncontrolled growth of abnormal cells inside one or both lungs. These cells grow to form tumours. More than 8 out of 10 cases of lung cancer in the UK are caused by smoking. If you’re a smoker, quitting is the best thing you can do for your health. Passive smoking also increases the risk. Lung cancer is more common in older people and in people with previous chest problems or lung diseases such as emphysema. Other risk factors include exposure to radon gas, air pollution and chemicals in the workplace. A cancer that starts in the lung is called a primary lung cancer, while a cancer that starts in another part of the body and spreads to the lungs is called a secondary lung cancer. The stage of a cancer refers to its size and how far it has spread. Doctors look at the size of the tumour, whether it is in the lymph nodes and whether it has spread to another part of the body. A small cancer that is just in the lung is likely to be an early stage cancer. One that has spread into the surrounding tissue or to another part of the body is an advanced cancer. You can find out more information about lung cancer by visiting the Cancer Research UK website. The right lung is divided into 3 sections called the upper, middle and lower lobes. The left lung is divided into 2 sections called the upper and lower lobes. Your lungs have a system of tubes that carry oxygen in and out as you breathe. The windpipe divides into two tubes, the right bronchus and left bronchus. These split into smaller tubes called secondary bronchi. They split again to make smaller tubes called bronchioles. The bronchioles have small air sacs at the end called alveoli. In the air sacs, oxygen passes into your bloodstream from the air breathed in. Your bloodstream carries oxygen to all the cells in your body. At the same time carbon dioxide passes from your bloodstream into the air sacs. This waste gas is removed from the body as you breathe out. Close to the lungs and airways are lymph nodes (also called lymph glands). They are part of the lymphatic system, a network of tubes and glands in the body that filters body fluid and fights infection and illnesses like cancer. Lymph fluid circulates through body tissues. Cancer cells may be released from a tumour in the lung and then get trapped in nearby lymph nodes. Your surgeon or medical cancer specialist (oncologist) checks your lymph nodes for cancer cells when you are diagnosed. The pleura or pleural membranes are 2 fibrous sheets of tissue that cover the lungs and help to protect them. The gap between the pleura is called the pleural space. The pleura make a lubricating fluid that keeps them moist so they slide easily over each other as we breathe in and out. Lung cancer cells can spread to the pleura. The cancer cells inflame the pleural membranes and they then make too much fluid. The fluid collects in the pleural space and stops the lung from expanding fully. This can make you feel breathless. Build up of fluid between the pleura is called a pleural effusion. Lung cancer is the third most common cancer in the UK. In 2015. around 46,400 people were diagnosed in the UK. Lung cancer is more common as you get older. More than 40 out of 100 people (more than 40%) diagnosed with lung cancer in the UK are aged 75 and older. 72 out of 100 (72%) of lung cancer cases in the UK are caused by smoking. A rare cancer called mesothelioma starts in the protective sheets that cover the lungs (pleura). This is very different to lung cancer. Cancer can spread into the lung from other parts of the body. This is called metastatic lung cancer.